When a focussing scale is intermediate between two marks, how do you calculate the proportional value? In the photo on the right, the distance mark is about 0.75 of the way from 3 metres to infinity: what distance is it focussed on? Click the Example button below to answer this question. "Everything to do with lenses works in reciprocals. That's all you need to know, really." 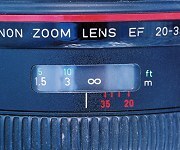 Look at the three equally-spaced marks visible in the window of the lens above: 1.5 - 3 - Infinity (metres). Why these values? Because if you take reciprocals, they are equally spaced apart: 1/1.5=2/3 - 1/3 - 0. So to find the value for halfway between the 3 and Infinity marks, we take the mid-point of the reciprocals (1/3 and zero, making 1/6) for a focussing distance of 6 metres. Three-quarters of the way corresponds to the reciprocal between 1/6 and zero, that is 1/12. These are close! We need six significant figures to see any difference. But of course, if you try to extrapolate (entering a proportion value of 10, or the opposite ends of the focussing scale of a macro lens), this breaks down. Just for the exercise, let's consider a 50mm lens, with focussing marks for 5 m and Infinity, and find the exact focussing distance for the midway point. We'll subtract the 50mm from the lens-to-subject distance to account for the fact that camera manufacturers measure the focussing distance not to the lens, but to the film plane (but we'll forget the extra fraction of a millimetre!) So u' = 4950. Now calculate v', the lens-to-film-plane distance for the 5 m focussing mark. Midway focussing = 9842.6 + 50 = 9892.6mm, just under 11 cm short of the 10 metres the calculator gives. Conclusion: it works!